Colin Dobson, photographed with his book and his parents, Kenny and Dena. 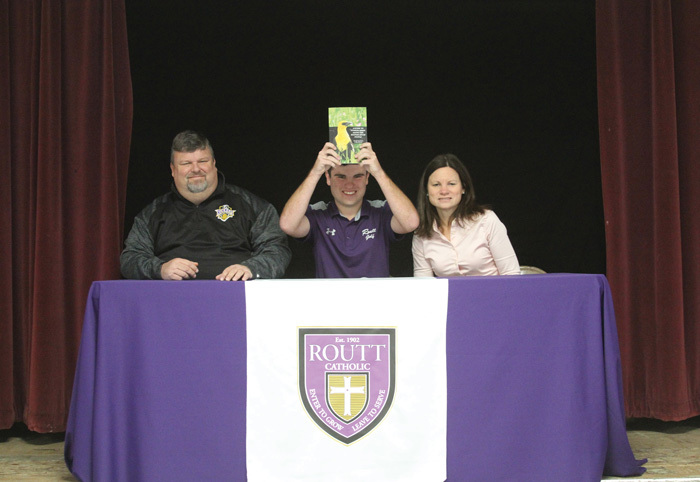 As a senior at Routt Catholic High School, Colin Dobson has already checked off a box on his list of goals. This success came with the publishing of his first book, “A Guide to Finding Birds Along the Illinois River Flyway.” The book is an easy to use guide for any level of “birder” when planning their next trip into the wild. Dobson began birding at a young age with a family friend, Tony Ward. What started as a weekend hobby grew into a lifetime passion. Within a few years of starting, Dobson was already making a name for himself in the birding community. He participated in interviews and research and provided input to organizations such as ebird.org, Illinois stories and on illinoisbirds.org. With the countless hours he has dedicated to research and growth in this field and the publication of the book, Dobson has cemented a spot as a top birder in Illinois. When Dr. Joseph Steensma, professor of practice for the Brown School at Washington University, approached him with the idea of a book in December of 2017, Dobson took the chance to share his passion and knowledge with the world. After nearly a year of hard work, Dobson is a published author. This first book is only the beginning for Dobson. After graduating this coming May from Routt Catholic High School, Dobson plans to attend either the University of Illinois or Kansas State in the fall, where he is looking to study wildlife management. Dobson has no plans of slowing down after graduating with his bachelor’s degree however and is already looking to pursue a Master of Science degree in a branch of zoology called Ornithology which focuses strictly on the study of birds. Amid all this Dobson is looking at publishing a second edition of his book with more photography and updated information within the next five years. Dobson has some big plans but is proving that he is a man to bet on in the future. To get a copy of Dobson’s book all you need to do is head to Amazon, GoogleBooks or Goodreads and type in his name. Dobson is the son of proud parents, Kenny and Dena Dobson.